Annemarie Spitznagle keeps a notebook. She has since she was a kid. “My mom found lists and notes to myself everywhere,” Spitznagle said of her childhood. More than a journal or diary, the notebooks have been like close friends, the kind who listen patiently and reserve judgment. The contents of Spitznagle’s notebooks have changed as she’s grown up and her interests have evolved. But through it all, two themes have remained constant: home and cooking. Spitznagle, the daughter of an Air Force pilot, was born in Japan but raised in Louisiana. It was in Louisiana Spitznagle’s identity took hold in her family’s Cajun culture. Central to her family’s way of life was food. In a Cajun home, the kitchen is court and food is king. “I’d come home from school, drop off my backpack and join my mom in the kitchen,” Spitznagle said. Meals took hours to prepare and almost as long to enjoy with one another. Spitznagle was in charge of desserts. He buys bottles of wine to be used. In Berge’s opinion, wine is meant for drinking, ideally with great food and friendly company. And 22 years of tasting and buying wine has only cemented this belief. Today Berge is a successful businessman - he owns six Barriques throughout the Madison area including one in Middleton’s Cayuga Court - but this wasn’t always the case. His success is more than two decades in the making, with ups and downs and turns unforeseen. There’s an old saying about going to dinner and a show. When Rod Ladson is the chef, dinner is part of the show. 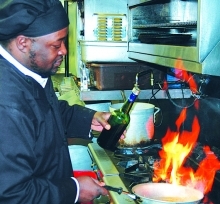 For nearly five years now, Ladson has been center stage as executive chef at Johnny’s Italian Steakhouse, 8390 Market Street in Greenway Station. He treats the 1940s-themed restaurant like a theater. The bartenders are called “bootleggers.” All servers have a role to play. The kitchen is like a sweltering green room accented by bubbling saucepans and the perpetual clattering of dishes. A United States District Court judge in July of 2012 ruled that the City of Middleton’s police force did not discriminate against a local nightclub because of its clientele’s race. In a 23-page opinion and order, the U.S. District Court for the Western District of Wisconsin ruled entirely with the defendant, in addition to rebuking the plaintiff, Scott Piernot and his company, Garrganntuan Ventures, LLC. Over the course of two and a half years, Piernot and his company ran Scatz Sports Bar and Nightclub. While open, Scatz was the largest nightclub in Dane County, with an occupancy limit of 949 people. Scatz came into frequent conflict with the Middleton Common Council and local law enforcement agents. It was eventually designated a public nuisance by the city. West, a provider of technology-driven communication services, on Nov. 14 announced the expansion of its Middleton office and the addition of 100 full-time positions before the end of the year. 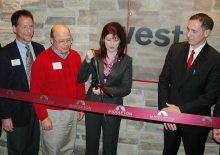 West hosted a ribbon cutting ceremony at the Wisconsin Trade Center Building, 8401 Greenway Boulevard with Lieutenant Governor Rebecca Kleefisch, Middleton Mayor Kurt Sonnentag, and Middleton Chamber of Commerce Executive Director Vann Nutt in attendance. West is expanding by 100 full-time Sales Associates and Account Management positions. Traveler’s Hearth Café and Games has closed its doors just a few months after opening for business. Jim Mirkes and his son, Tim Mirkes, ran the gaming coffee house together at 2831 Parmenter Street. On Nov. 26, the management posted a message on the Traveler’s Hearth Facebook page confirming the closure. 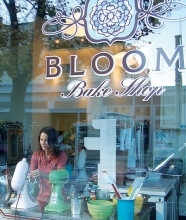 The site was formerly the Blue Spoon.